A new facility required the addition of a new UPS, one that was capable of safeguarding a wide range of critical equipment and maintaining continuous uptime for employees. 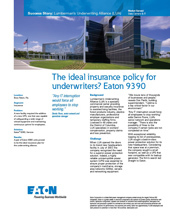 A pair of Eaton 9390 units proved to be the ideal insurance plan for the underwriting alliance. When LUA opened the doors to its brand new headquarters facility in July of 2007, the company recognized the need for a superior power protection solution. Indeed, a highly reliable UPS was essential to ensure proper protection of the company’s mainframe, storage area networks (SANs), servers and networking equipment. With the installation of the two 9390s, LUA has achieved an insurance policy of its own.